Folks, my very best wishes to everyone for the New Year. Welcome to my official site, the communications part of which has been sadly remiss for a long time. ‘Touchline’ has been dark for over a year; my regular, diary-like chronology of an artiste’s life thru which we kept in touch; it is my fervent hope and promise to write more regularly, at least every quarter if not monthly. I had better explain my reasons for absence. I re-connected with the academic world. I embarked upon an MA at the Dept. of Modern Irish, in University College, Cork, which took time and effort, especially from the second semester onwards. It is a draining, debilitating, all-consuming, yet satisfying disciple for a middle-aged man or woman who has another job, and must, by its very nature, impact on family, relationships and livelihood. I choose to examine the work of three Munster (Ireland’s southernmost province) Jacobite poets in the light and influence of “Bonnie Prince Charlie”, the “Young Pretender” the final hope of Stuart restoration. This hope and aspiration fine-tuned the aisling or visionally poetry of eighteenth-century Ireland and became a beautiful,yet effective political tool. The three chosen poets were Aindrias Mac Craith, one of the Maigue poets (of Croom “of the merriment”) and Corkmen Piaras Mac Gearailt who brought us Rosc Catha na Mumhan and Seán Clárach Mac Domhnaill whose Mo Ghile Mear was once short-listed for the Irish national anthem. It shocked me to learn, through close study of the poetry of the period and and deeper cognisance of the Irish language, how much the native Irish suffered in that period with religious and language eclipse, loss of land and deprivation. The knowledge gained brought me to a hitherto unentered territory of Irish identity. It was a torturous few months of pain and discomfort and my tutor suggested I take another year for the thesis. The thoughts of another year only increased the pain! Thankfully I got on fine in the end as the shingles subsided somewhat and the work became more focussed. We booked the flights then and there. It was so wonderful to return to Dunedin, Florida and visit old haunts and my old condo with James who said: “What kind of an eegit were you to leave a place like this!’ It was 98 degrees end of October and he couldn’t believe it. We hung with Patsy Dunlea, a great singer, guitarist and fantastic cabinet-maker and a good friend to me while I was there. Patsy hosted us decent. We met many old friends like Dublin folk singer Brendan Nolan who played some nice guitar with us on our Soldiers’ Songs album. We swam, cycled up and down the Pinellas trail and had some gas nights at the Dunedin Brewery. I played a few gigs in New York; places like The Landmark Tavern in Hell’s Kitchen, the Singers’ Club in Queens, and several taverns. We stayed with our great friends, singer Donie Carroll and Theresa, his partner. A few weeks after I returned, I was invited to a terrific festival in Liverpool, England. An old friend in the University, Vic Merriman was incidental in booking me and setting up a gorgeous solo gig at a sweet 130 seater theatre. The pubs, attitude and accent of Liverpool all evince a solid ethnography, a fiercely autonomous town with open, friendly people. Thereafter, I had a handsome train trip to “Dublin and the North” for smashing gigs like The Sunflower Folk Club in Belfast and the Clé Club in Dublin. Did you ever take that train ride along the northern coast through Ballymena from Belfast? At Derry, I was met by my host Neil McGrory who drove me to his family’s peerless hotel, “McGrory’s of Culdaff” with fascinating historical commentary from Neil as each headland, harbour beckoned to him like a lighthouse along the way. The session each Friday at McGrory’s in the very tip-top of Donegal near Malin Head is something every musician and lover of Irish culture must savour; not to mention their famous potted mackerel starter! Christmas heralded a series of lovely dinner parties at my place in the Holy Ground,my ex-wife Evelyn’s, and in the homes of good friends which rang in the new year in gregarious company. 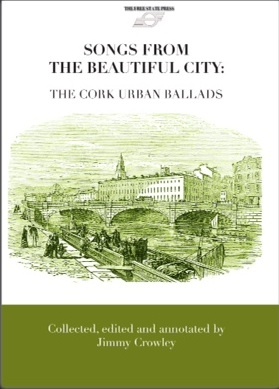 The year fifteen will hopefully release us all from the long wait for my song collection, Songs from the Beautiful City: The Cork Urban Ballads. I thank all those who have made pre-orders for the book which has helped greatly to defray expensed in the first print run as it’s a self-financed operation. Those altruistic souls will soon be rewarded by a special, hardback edition of the book. I have a bunch of new songs ready; many written during my tenure in America which will make up my next album, Life, which will be out in the next 18 months,if the good Lord spares me. The LP is my observations on my own life with hopefully, many universal truths, for as Plato said, ‘The un-observed life is not worth living.’ So, observe your own life,dear friends, and some of you many even turn certain motifs, observations and episodes into art. Watch out and listen up for my single, Feel Like a King from the Life album very soon where hopefully I have hit on the universal theme of a father who feels he hasn’t spend enough time with his son ,being lured by the seductions of fame and the road.Vide Harry Chapin! Then, there’s me first and probably only novel, Hy Brazil, about a resurgent, Celtic Ireland in the near future. The work is completed; though it may need a serious look over.I’d love to release it for 2016 as it’s about the lost ideals of the revolution of 1916. Go dté sibh slán idir an dá linn agus ath-bhliain fé bhláth is fé mhaise.